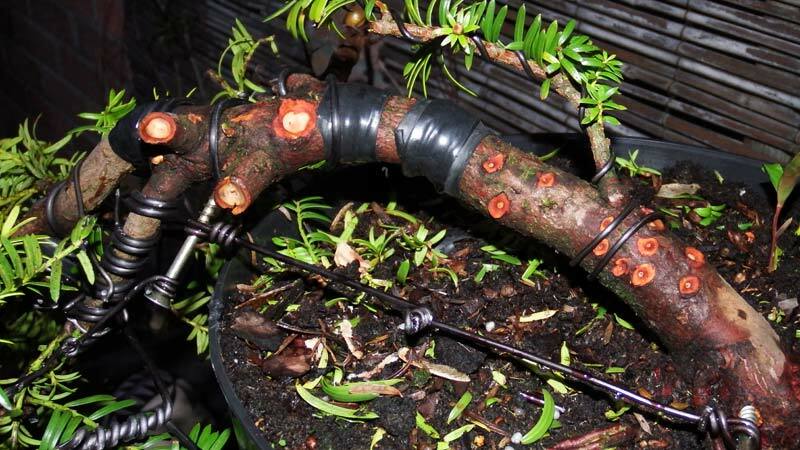 Challenging the Bonsai A to Z entry for Notching to bend thick branches. The branch is weakened by cutting a V-shaped wedge across it though not all of the way through the branch. Then using coiled wire, or a guy wire, the gap is pulled shut. Protect by sealing with waterproofed tape. The procedure is best performed in early spring, or in late summer during the quiescent period when there is less bleeding and less heavy callousing. There are 819 entries in the A to Z and the pages have been viewed 3061888 times. Help us to increase the number of relevant bonsai terms included in this A to Z of Bonsai Terms. We include manufacturers and dealers in the dictionary, if you are one or know of one not mentioned then just click the link above and add an entry. If you have a favourite bonsai tree not mentioned just add an entry. We are trying to create a unique single free source for all bonsai terms and hope to capture worldwide bonsai terms for bonsai trees, bonsai clubs associations and national collections and the A to Z is free marketing for bonsai businesses and bonsai clubs.